ACM - Alternate Calculation Method - California Building Energy Efficiency Standards for Low-Rise Residential Buildings allow compliance by either a prescriptive or performance method. Performance compliance uses computer modeling software to trade off efficiency measures. For example, to allow more windows, the designer will specify more efficient windows, or to allow more west-facing windows they will install a more efficient cooling system. 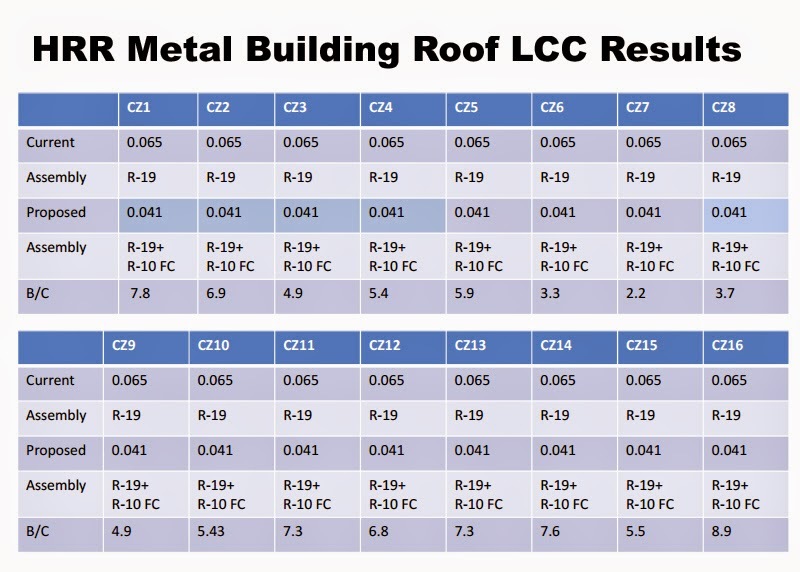 Computer performance compliance is typically the most popular compliance method because of the flexibility it provides in the building design. CASE - Codes And Standards Enhancement - Through CASE Reports, the IOUs will provide the California Energy Commission with the technical and cost-effectiveness information required to make informed judgments on proposed standards for promising energy efficiency design practices and technologies. Stakeholder Meetings provide an opportunity for stakeholders to help inform the development of these codes change proposals. The IOUs encourage participation in this step of the process through the submission of data— both primary sources and references to existing data, e.g., reports, spreadsheets, etc. 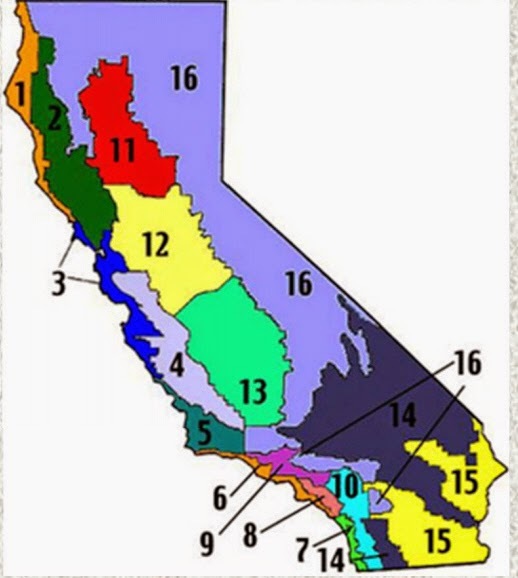 CZ - Climate Zone - 16 zones in California used by the California Energy Commission to determine which energy efficiency measures are appropriate in which environment. In more moderate climates along the coast, certain energy efficiency investments may not be economic. FEG - Fan Efficiency Grades - A numerical rating that classifies fans by their aerodynamic ability to convert mechanical shaft power to air power. A more efficient fan model will have a higher FEG rating. FEGs apply to the efficiency of the fan only and not to the motor and drives. This metric has been adopted by ASHRAE and was created by the Air Movement and Control Association (AMCA). LPD - Lighting Power Density - Technically represents the load of any lighting equipment in any defined area, or the watts per square foot of the lighting equipment. However, in the lighting industry it is often associated with the lighting power allowance (LPA) permitted by the building energy code in question. Increase steel-framed wall, similar to nonresidential req. Thermally Driven Cooling - This potential new code change affects newly installed thermally driven chillers where the cooling effect is driven by heat rather than mechanical compressors. The heat source could be solar thermal, waste heat, or a combination. The waste heat could be process heat, cogeneration, or other sources. Absorption chillers are the most common form of thermally driven chillers and have been available for over 50 years. A number of manufacturers currently offer a variety of absorption chillers. Another form of cooling that makes use of waste heat is desiccant cooling. Desiccants are used to remove water vapor out of an air stream and waste heat is used to regenerate the desiccant so it is ready to absorb more water vapor. The dried air is then evaporative cooled. This potential change would offer a Title 24 compliance credit for the performance (whole building simulation energy trade-off) approach when cooling spaces with a thermally driven chiller. This is neither a prescriptive requirement nor a mandatory requirement and does not affect the base case budget of the performance approach. This change would allow some nonresidential and high-rise multifamily buildings to take credit for the presence of a heat recovery chiller. Door and Windows Switch Controls - Any directly conditioned space with manually operable wall or roof openings to the outdoors shall be provided with interlock controls that disable mechanical heating and mechanical cooling to that space (e.g. by resetting the heating setpoint to 50o F and the cooling setpoint to 100o F) when any such opening is open. Mechanical cooling may remain enabled when an opening is open if outside air temperature is below space temperature. Occupant wants more fresh air and does not know or care about heating/cooling energy penalty. This is particularly true when the space temperature can be maintained at setpoint despite the extra infiltration load. Occupant does not know the zone mode (heating/cooling) or outside temperature so cannot gauge if opening the window will reduce or increase energy use. Occupants will quickly learn that HVAC is interlocked and thus will feel free to open windows without fear of wasting heating/cooling energy thus resulting in improved air quality and occupant satisfaction. Studies have shown that occupants are willing to accept wider temperature dead-bands in buildings with operable windows. Signal lights can easily be included (e.g. green light on thermostat display) that encourage occupants to open windows when conditions are favorable, thereby increasing energy savings and allowing occupants to feel good about saving energy. 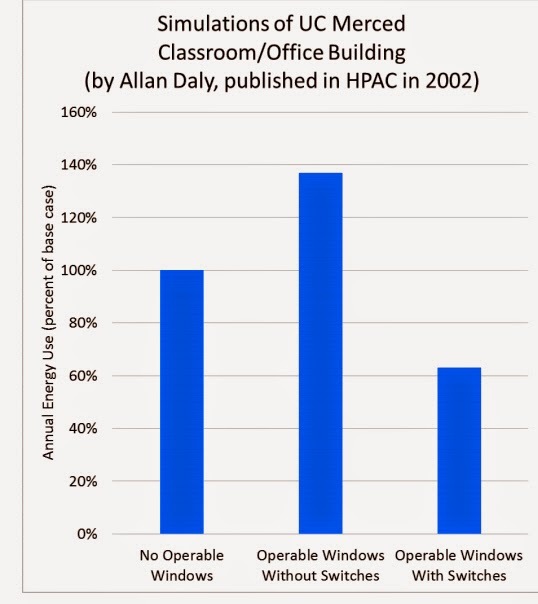 The ACM rules will encourage architects to include operable windows in their designs. Fan efficiency grades - The fan efficiency measure will propose using a new metric known as the Fan Efficiency grade (FEG), a metric adopted by ASHRAE and created by the Air Movement and Control Association (AMCA). The fan efficiency measure will require a minimum FEG of 67, and the total efficiency of the fan at the design point of operation shall be within 15 percentage points of the maximum total efficiency of the fan. This measure may for the most part already be a standard practice in the industry, as a FEG value of 67 is not a very high bar. Energy savings may be minimal, but the minimum can always be raised once the metric is established. Direct Digital Controls - The proposed measure is derived from ASHRAE 90.1 (2013) Section 6.4.3.10 and has already been vetted publically. Would mandate DDC systems for certain building applications that are currently not required. By expanding the scope of applications requiring DDC, energy management data would be more readily available allowing for more efficient systems operations and the implementation of effective energy efficiency strategies. The measure would also specify the minimum capability of such mandated DDCs to ensure the full benefit of DDC for energy management. Monitor zone and system demand for fan pressure, pump pressure, heating, and cooling. Transfer zone and system demand information from zones to air distribution system controllers and from air distribution systems to heating and cooling plant controllers. Automatically detect those zones and systems that may be excessively driving the reset logic and generate an alarm or other indication to the system operator. Readily allow operator removal of zone(s) from the reset algorithm. For new buildings, the DDC system shall be capable of trending and graphically displaying input and output points. HVAC Economizer Modifications - The 2013 Title 24 code requires that economizers be installed on packaged HVAC units commonly known as Roof Top Package Units (RTU) with cooling capacity equal to or greater than 54,000 Btuh. In practical terms, 5-ton RTUs and larger must have an economizer. Controls for economizers must have a Fault Detection and Diagnostic (FDD) system that meets a list of requirements in section 120.2(i). The controls requirements have been reviewed by the industry and the FDD Committee of the Western HVAC Performance Alliance, and are approved and listed by the California Energy Commission. Recent laboratory testing has developed new insights to the performance of economizers. Clarify that controls for the economizer can be either stand alone or integrated into the RTU system controller. Manufacturers must list their compliant controller, either standalone or integrated, with the CEC.2 Also clarify how faults shall be reported in section 120.2(i)7. Explore whether refrigerant pressure sensors requirements should still be included in section 120.2(i)3. Also, explore exempting packaged direct expansion units from refrigerant charge testing by modifying acceptance test requirements. Modify standards to address field study findings indicating that when economizer dampers are fully open, airflow is rarely equal to 100% of the design airflow. 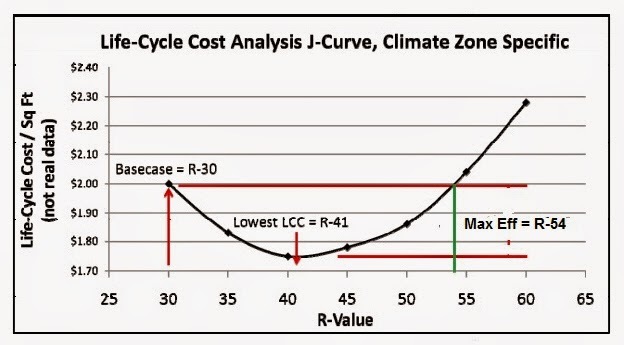 Modify standards to address field study findings indicating that leakage through economizer dampers is much higher than designed. Coordinate and collaborate with the ASHRAE proposed standard 207P committee to develop a fully vetted standard for FDD. Integrate the Economizer Testing guidance document into the Nonresidential Appendix and other appropriate locations. Develop the scope of work for lab and field data necessary for projected 2019 Title 24 modifications. Elevator Lighting and HVAC Controls - Based on ASHRAE 90.1. 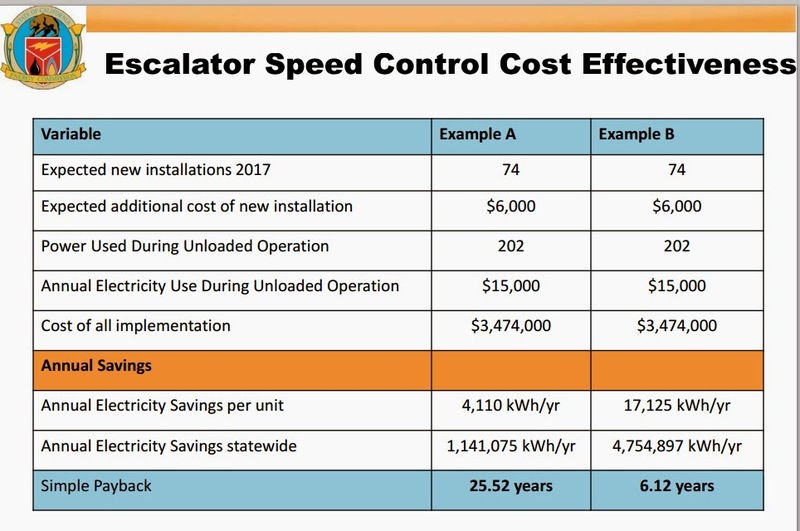 Anticipated to be mandatory, This measure is being proposed in order to reduce electricity use in elevators when they are unoccupied, as well as reducing the energy used during operation. Will require elevator cabins to turn off lighting and ventilation when unoccupied for more than 15 minutes. Will require all cab lighting systems to have an efficacy greater or equal to 60 lumens per Watt. (ASHRAE 90.1 is only 35 lpW). Cab ventilation fans for elevators without air conditioning shall not consume over 0.33 W/cfm at maximum speed. 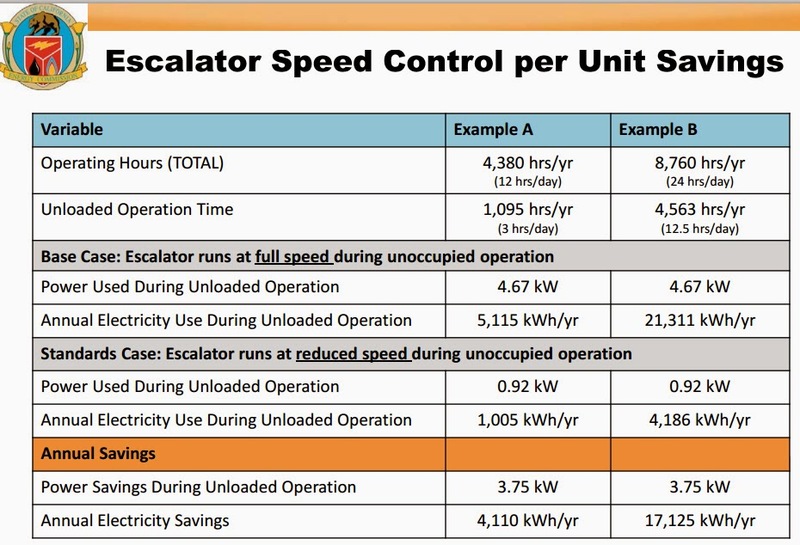 Escalator and Moving Walkway Speed Controls - Based on ASHRAE 90.1. Adds a prescriptive requirement that new escalators and moving walkways must be equipped with speed control technology under the guidelines set forth in ASME A17.1, 2013. Currently escalators and moving walkways run at full speed during all hours of operation in the state of California, whether they are loaded or not. Intermittent speed escalators and moving walkways are popular in Europe, and a few have already been installed in California with a special variance. 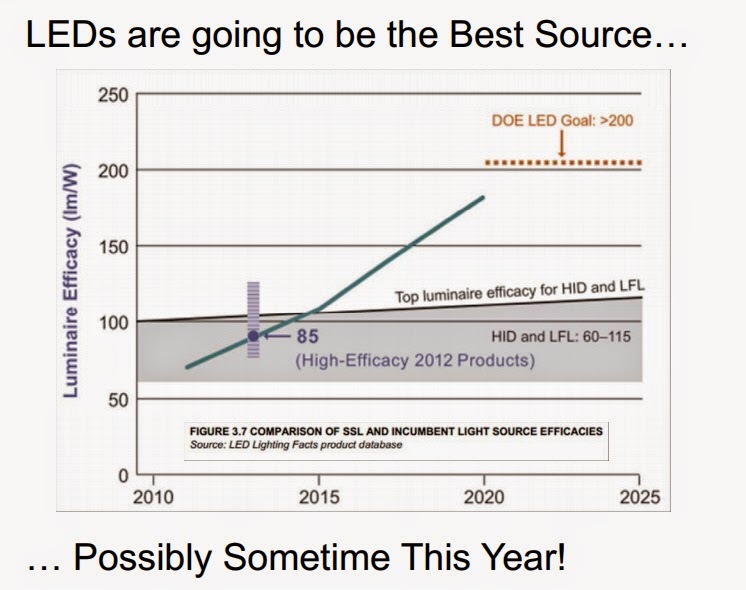 Nonresidential Indoor Lighting Power LPDs - The Lighting Power Densities (LPD) in Title 24 are subject to change as new technologies (in particular, light source technologies that increase lamp efficacy) become available to the market. As a result, the LPD values continue to be revised downward over time in response to these technological advancements. 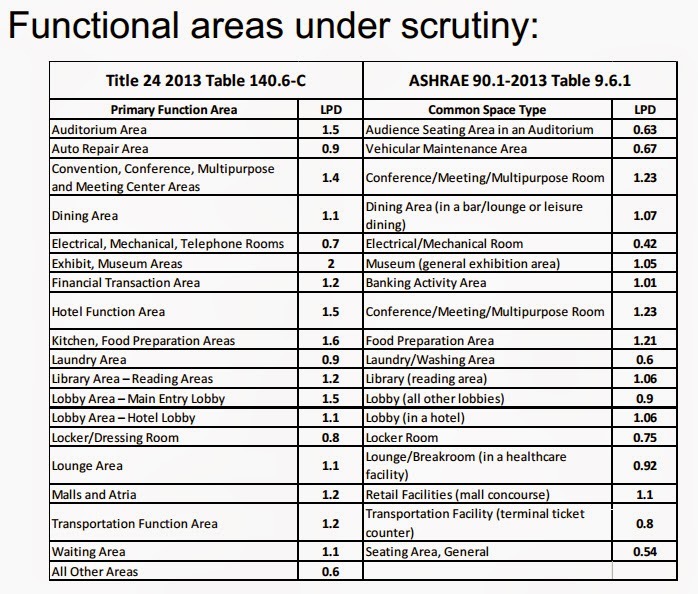 ASHRAE 90.1-2013 has recently adopted LPD values for several building spaces that are similar to Title 24 LPD values. While 90.1 and Title 24 aren’t always directly comparable, there is widespread compatibility of the allowances in the two documents. Title 24 is required to have an energy code that is at least as stringent as the national energy code, however, ASHRAE 90.1-2013 is more stringent in some cases. This measure intends to make LPD adjustments to a selection of space categories and whole building values to reflect the values that have been established by ASHRAE 90.1 in their consensus-built document. HPT8 lamps are marginally better than they were 5 years ago, but much more prevalent. 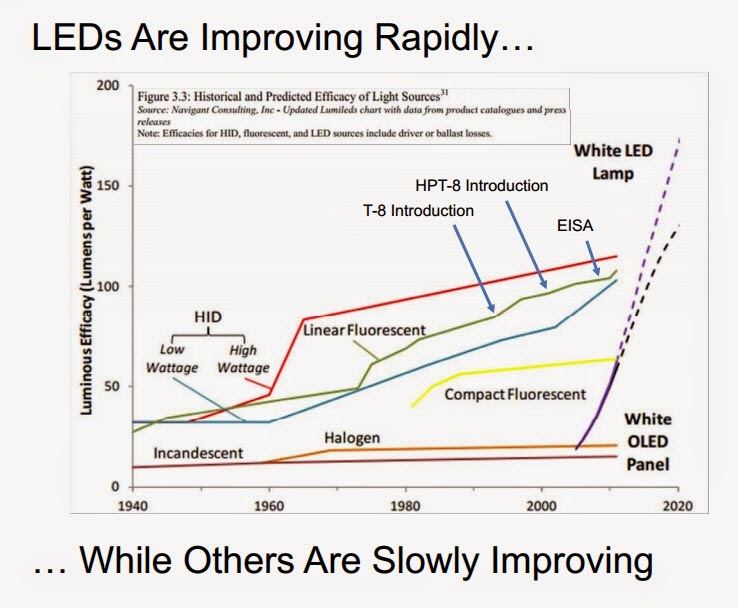 LED light sources are rapidly improving light sources are rapidly improving. Partial-ON Controls Requirements - The existing lighting controls in Title 24 do not require partial-ON lighting controls. There is an existing power adjustment factor (PAF) in Table 140.6-A that provides an adjustment to the lighting power allowance (LPA) for spaces that include a partial-ON control approach (0.20 factor). There is a second PAF in Table 140.6-A that is intended for a combined Partial-ON and manual dimming control approach (0.25 factor). The partial-ON requirement has now been employed in ASHRAE 90.1-2013 as a minimum required measure (in conjunction with a manual-ON option). As a result, this approach has the general support of the design community. The intent is to remove the two PAF allowances and add language to Section 130.1(c) that will mandate the use of partial-ON occupancy sensors in applications where appropriate. While the use of lighting controls is widespread, many designers employ an Automatic-On (to 100% output) approach for spaces. 100% output) approach for spaces.Manual-On (Vacancy Sensors) is employed for energy efficiency projects and by “green design teams regularly. Issue: Lights coming on in the dimmed state can cause flicker the dimmed state, can cause flicker and strobe and strobe problems. [CASE Team] This is an issue, but in many cases this is a result of improperly paired ballasts and lamps, not necessarily the fault of the dim level, especially since the level that the lighting is required to energize at is in the 50-70% range, rather than at a very low level. This concern will be considered in the language proposed for the code revision. Occupancy Sensor Maximum Delay Time Requirement - The current language in Section 130.1 does not define a maximum delay time that occupancy sensors are permitted to be programmed with under normal circumstances. Section 1605.3(L)(2)(G)1 of Title 20 (the California appliance standard) defines that the maximum delay time that is permitted to be available in an occupancy sensor device sold in California is 30 minutes, however, that is not reasonable guidance for the maximum delay time under normal design circumstances. For this reason, and in keeping with the general recommendations that are established in ASHRAE 90.1, the intent is to add a maximum delay time to Section 130.1(c) to limit delay time to 20 minutes in all circumstances. This maximum will also be added to the acceptance testing process for occupancy sensors. Outdoor lighting LPAs -The Outdoor Lighting Power Allowance (LPA) values in Title 24 are subject to change as new technologies (in particular, light source technologies that increase lamp efficacy) become available to the market. As a result, the LPA values have continued to slowly move downward over time in response to these technological advancements, most recently for pulse-start Metal Halide technology. 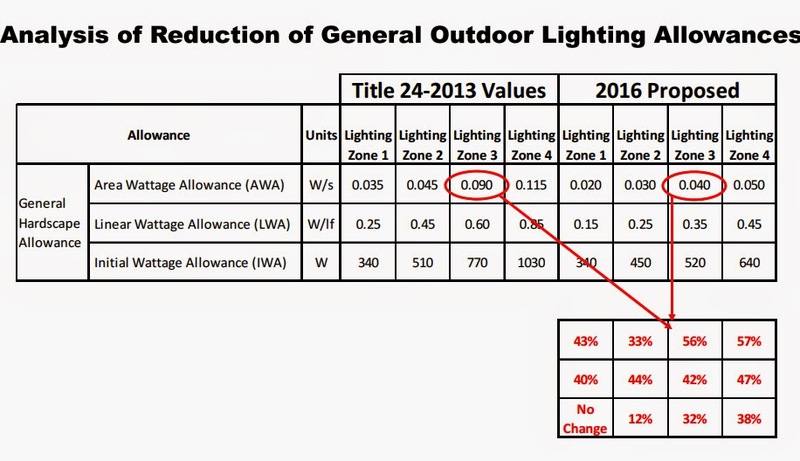 ASHRAE 90.1-2013 has recently adopted values for exterior lighting that are similar to Title 24 LPA values. While 90.1 and Title 24 aren’t always directly comparable, there is widespread compatibility of the allowances in the two documents. However, ASHRAE 90.1-2013 is more stringent in some cases, and Title 24 is required to have an energy code that is at least equal to the national energy code. 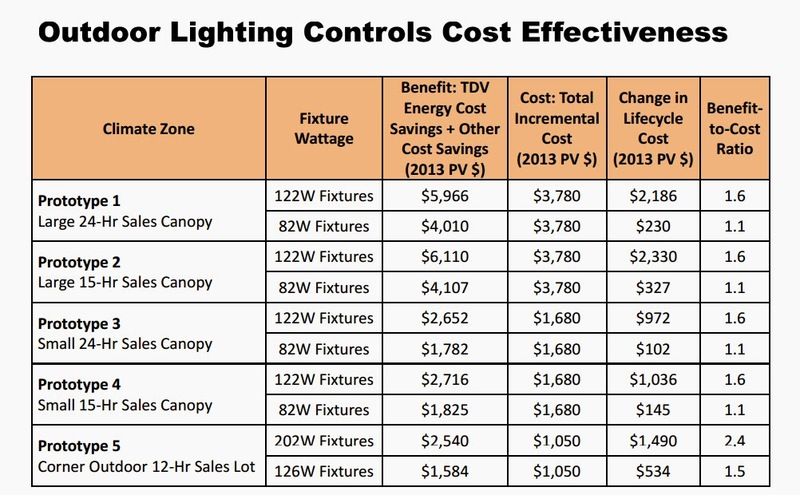 Removal of occupancy lighting controls exception for sales lots and sales canopies - Title 24 2013 included new lighting controls requirements for exterior fixtures. The most significant of these requirements calls for occupancy sensing capability and a corresponding reduction in wattage and output during vacant periods. The code language created exceptions for a number of different applications, including sales lots and sales canopies. This code change proposal will consider removing the exceptions for these applications. The proposed code change will not impact the exception for sales frontage, as defined in the code. Revision of lighting controls exception threshold for exterior fixtures - Title 24 2013 created exceptions to the occupancy sensing/bi-level requirement for pole mounted fixtures less than 75 watts and non-pole mounted fixtures less than 30 watts. This code change proposal will evaluate if market and technology developments justify reducing these thresholds. Green Job Creation - Most new jobs should and will be created in the private sector, but government can play an important role in establishing a favorable climate for job creation. Good one you explain. all building and civil related work to must use for the pre engineering process is very well done to introduce. Majorly access material is boom lift rental for access and tools used for core work. Thanks for the opportunity. and Thanks for post and creadited to Sendhamarai Engineering.